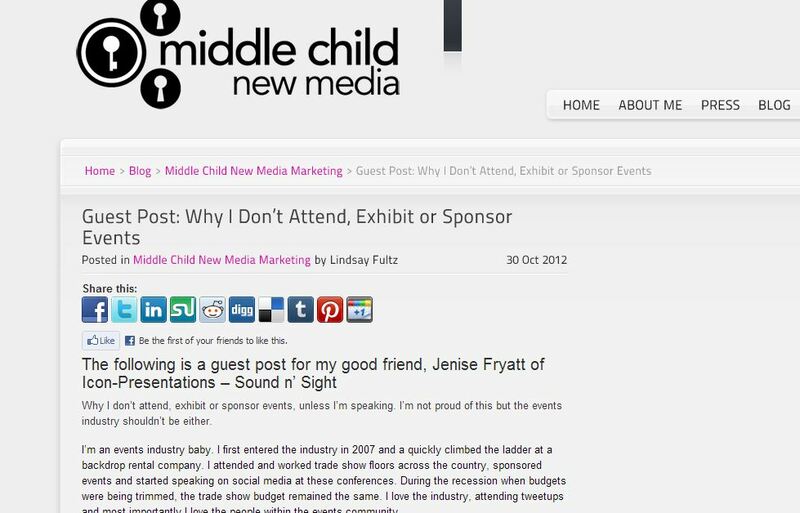 In the euphoric after-glow of IMEX America Lindsay Fultz’s provocative piece on why she doesn’t attend, exhibit or sponsor trade shows and events provides a nice counter-point [access here]. Now Marketing Manager for LoveIt, an LA based technology start up (looks like Pinterest to me) Fultz spent about 5 years in and around the meetings and events industry and, judging from her blog-post, knows it well. Her points are all the more relevant at a distance from the industry she once made her living in. She declares undying love for our industry and its people but castigates our event marketing capabilities focusing on unreasonably high costs and poorly targeted audiences. She is critical of the tendency to super-size events and to value quantity over quality and considers the deployment of social media to be hopelessly inadequate. Overall, it’s a passionate, sincere, thought provoking commentary. 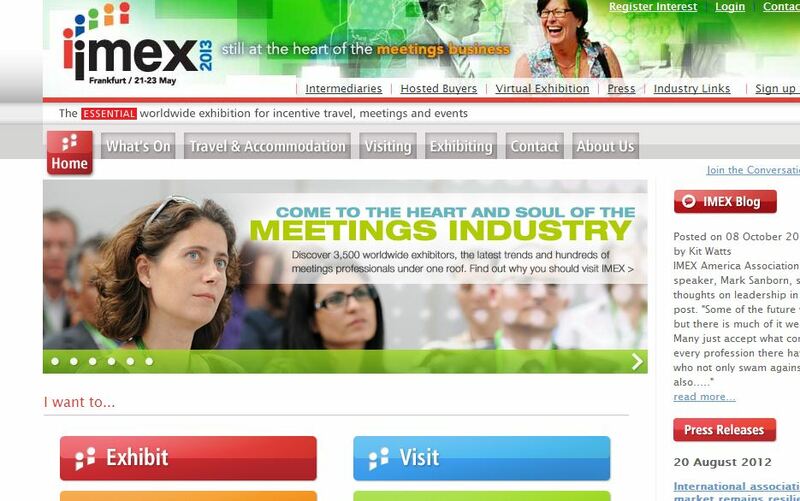 It also helps us to identify the 5 reasons why IMEX America is so successful. Lindsay correctly outlines how trade show and event organisers frequently engage in “spray and pray marketing” to recruit delegates and attendees. They build the show with the mistaken belief that “if we build it, they will come”. They leave to pure chance the single most critical success factor of the entire event: the attendance of and engagement with the right audience. The model employed by IMEX, both in Frankfurt and Las Vegas (and, in fairness, by Reed Exhibitions too at AIBTM and EIBTM), is different. The desired audience is actually flown into the show as hosted guests having already committed to a minimum number of specific appointments with exhibitors and sponsors. Thus exhibitors and sponsors are guaranteed a fixed number of face to face meetings – the first step in determining ROI. While the IMEX shows are fundamentally about business they have always been more than this and are fast becoming, in Europe and the US, the annual haj for the entire meetings industry. Many of our industry associations now co-locate some of their own community activities at IMEX and “Smart Monday”, the day before the show floor opens for business, has become a must-attend day of education, networking and socialising. Lindsay rightly underlines the prohibitively high participation costs at shows and events but when the show is a true community event where an entire industry assembles and convenes then it can actually represent good value as you’re sure to find all the people you need to meet there. IMEX is also a successful show because, unlike the shows and events that Lindsay debunks in her blog-post, it constantly innovates. IMEX truly lives the spirit of kaizen, that great Japanese buzz word from the 90s, and is committed to a process of on-going improvement and innovation. IMEX embraced CSR and sustainability, for example, way before it became fashionable with Carina Bauer’s sterling initiatives. IMEX organisers are super-close to their core customer base and ever-accessible throughout the live show. In this way they see and hear what’s happening, they harvest new ideas direct from the very people for whom their implementation would make a difference and then incorporate them into the infrastructure for the following year. Finally IMEX is a successful show because show creator and owner Ray Bloom has managed to assemble around him a team of wonderful people all imbued with the same vision, mission and values. There’s a human heart at the core of the IMEX shows that is alive, real and tangible. It beats to the same rhythm as the meetings industry itself and it showcases year after year the energy, vibrancy and palpable magic that is enacted when real people meet in real time in real places. For many of us the over-riding image of IMEX is of the diminutive Ray Bloom standing in front of the main entrance on the final afternoon of the show personally thanking everyone for coming. Padraic Gilligan is Vice President of Industry Relations at MCI and Vice President of Destination Services at Ovation Global DMC, MCI’s destination management division. So true about how IMEX and the whole team around Ray and Carina have lifted and helped others to lift our Meetings Industry to a higher, more strategic, ground. I too found Lindsday’s post thought provoking and in many cases, bang-on, as much of any industry really, not just our own, has stayed to an older model of build it and they will come, and has relied on the old and the true, which for the most part many attendees have moved past. This applies both to the conference / learning portions as well as the trade show portions of shows. I think in Canada Ignite Magazine and their new show have done a great job of a new and improved model, even if a bit naturally eastern-Canadian centric, and Incentive Works has also worked to up their game and ensure the content and experience are relevant, and that the audience who attends is indeed part of a community that enjoys this opportunity to be together, earning and doing business. Many of the partners do an excellent job of leveraging our community being together here as well, in both these cases and these are proving successful for participants and for the sponsors. As Padraic notes, the IBTM and IMEX models really have made the effort to recreate an experience in America that was missing these past few years. As part of the Vancouver booth (thanks for the shout out!) and responsible for the social media and experience elements that will support out team there, I have been inspired by the opportunities these shows have given us in both attracting a great audience of planners and partners, and in connection opportunities. We have been able to maximize the opportunities with the combination of hosted buyer appointments and the technology platforms and tools available today to connect with our industry colleagues and yes, friends, at these shows. This post is a great reminder that if you truly believe in what you are creating, push boundaries and build the right team around you, the potential to create successful events that celebrate and build our communities and the people within them can be a viable business. Is it hugely expensive – yes, but if this is the only investment we were able to make with our marketing budget, it would remain at the top of the list. If I was a sponsor looking for ways to connect with an active, business focused part of the MICE community in America, I believe that if you outline your objectives you would find that these types of shows, with their proactive staff and forward thinking mentality would find a way to work with you and maximize more than just your name on X – and I do agree with Lindsay (and likely many others) that sponsorship should not equal the number of times your name appears on a banner. Let’s all work on events that make sense. Trade Shows have been working for exhibitors and attendees for hundreds of years. The thoughts of a social media girl with 4 years and four month of experience in the industry has no relevance whatsoever. She obviously has no understanding about real relationships, branding or real world business. Yes, I did read the whole stupid rant. The agenda is obvious: badmouth face to face meetings to hype social media – who needs F2F meetings when there are websites like LoveIt where you can make business? My respect goes to Ray Bloom for creating a ‘meeting’ that is worth spending 16 hours just to get there (Berlin to Las Vegas).